Yesterday’s data showed that the economy wasn’t doing great… but there’s a bigger picture here. Yesterday, the economy turned a momentous corner. And not momentous in a good way. A “per capita recession”? What even is that? We’ve never heard that before. Basically it’s economic growth once you strip out the impact of population growth. So if it wasn’t for population growth, and immigration in particular, our economy would be going backwards. We’ve never bothered to do that before. But now all the papers are doing it. This is a new world. Australia's economy has slumped into a per-capita recession for the first time since 2006, leaving the country relying on population growth to propel its economy and creating a political hurdle for the Coalition. The Morrison government has pledged to reduce the migration rate but figures released on Wednesday show that without migrants fuelling consumption, Australia's economic growth would be going backwards. The Australian Bureau of Statistics data shows the economy grew by 2.3 per cent over the year and 0.2 per cent in the December quarter – below market expectations and well short of Reserve Bank forecasts of 0.6 per cent. The budget forecast of 3 per cent growth for 2018-19 and the mid-year economic update's revision to 2.75 per cent will struggle to be met, putting a strain on preparations less than a month out from Treasurer Josh Frydenberg's first budget. The fact that a major paper is leading its reporting of the GDP figures with a comment on immigration shows just what a hot-button topic it is. And people might be right to wonder why we’re still importing record levels if immigrants when our economy is actually going backwards. People might start to wonder at the sense of that. Spineless politicians on both sides might look to duck that whole issue and focus on the headline numbers, but there’s not much joy there either. The headline number was positive, but much weaker than people were expecting, and much weaker than the RBA had been forecasting. That makes the prospect of rate cuts more likely. When you break it down by components, you see that growth has been driven by public spending, which was the best performing component. But that’s not great. It’s saying that if the government wasn’t spending away, the economy would probably be going backwards. You can’t have a government-dependent economy… not for long anyway. That sounds ok, but when you remember that inflation was 1.8%, it means that in real terms, wages fell by 0.3%. The figures also showed that average compensation per employee (a fancy term for wages) rose just 1.5% in 2018. Put all that together, and you don’t have a pretty picture. Wages are going backwards, on a per-person basis we’re already in recession, and if it wasn’t for immigration and government spending, our economy would be stuffed. This is not the pre-election snap-shot Scott Morrison was hoping for, I can tell you that. All bets are off now. Rate hikes are a thing of the past. What the heck happened? Take a look at this chart here. This is a story of a hundred broken promises. Over the past six or seven years, the markets have continually over-estimated the trajectory of interest rates. They expected them to be a lot higher than they actually ended up being. And you can understand why. Because for all that time, the RBA was saying that the next move in interest rates would be up. They were saying that they would like to ‘normalise’ interest rates from their historically low levels, and they’ll be doing that just as soon as they possibly can. … and everyone was wrong. Now, things have become interesting. Markets are actually expecting lower interest rates. 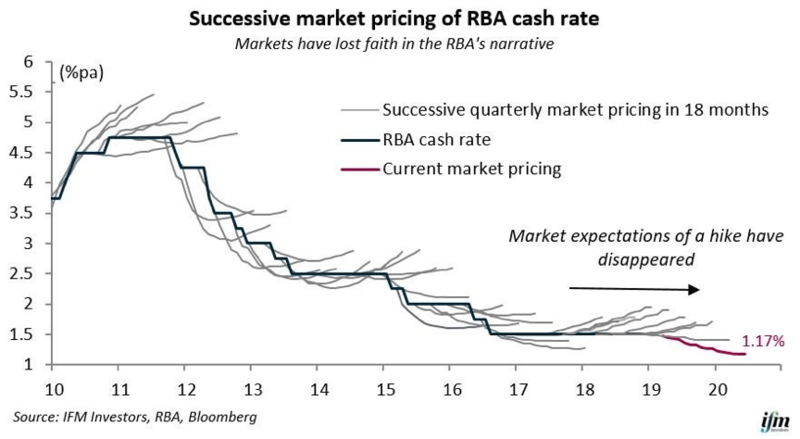 It started when the RBA gave up trying to sell the world on rate hikes and admitted that, actually, the next move in interest rates might not be up. Maybe things are about right where they are, and it’s a coin-toss as to which way the next move in rates is going to be. That led to most market economists downgrading their expectations as well. This week, Westpac’s Bill Evans broke ranks and said he now believes the next move in rates will be down. The curious thing here is why anyone thought interest rates would be going up in the first place. 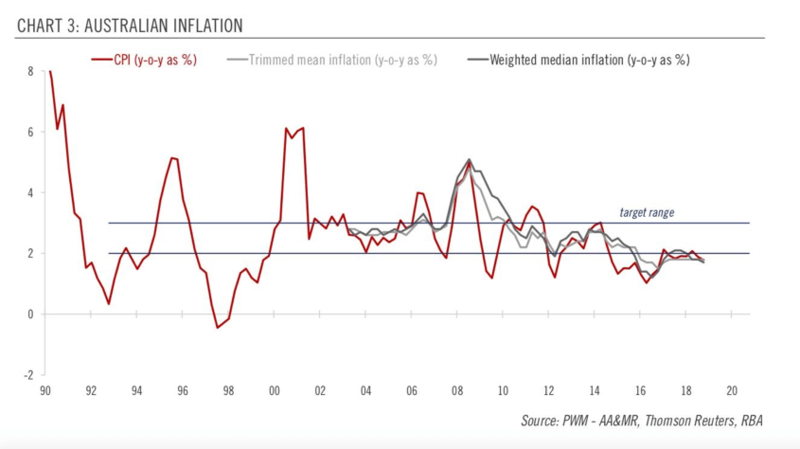 When you look at inflation (the metric that the RBA is supposed to care most about) – it’s barely making it into the RBA’s target band. There’s hardly a case for rate hikes there. Probably where they got the idea that rate hikes would be going up is this chart here. 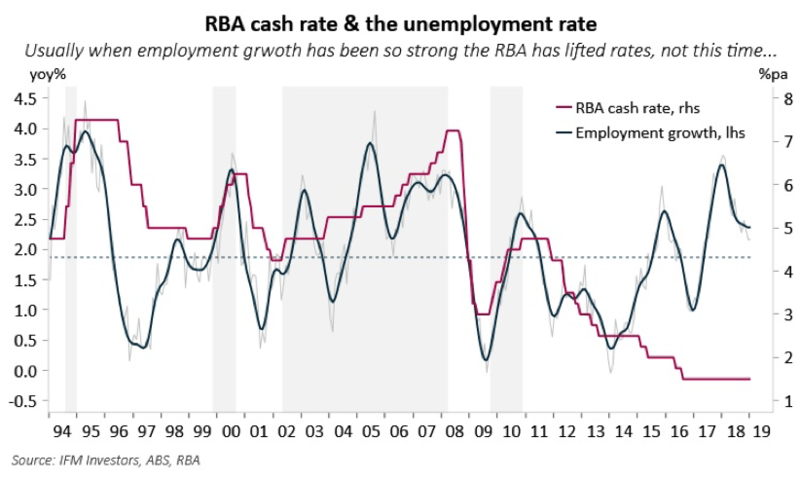 This is employment growth vs the RBA’s cash rate. As you can see, historically, they’ve moved pretty closely together. When jobs growth is strong, interest rates rise, and when it’s weak, they fall. For twenty odd years that rule of thumb served us pretty well. But around 2013 it started to break down. Jobs growth was strong – going great guns actually – but interest rates were stuck to the floor. And to be fair, most economists were thinking it would have to happen sooner or later. Strong jobs growth would feed into stronger wages growth, which would turn into stronger inflation numbers. But it just didn’t happen. And I reckon the key to understanding why that transmission mechanism broke down is this chart here. 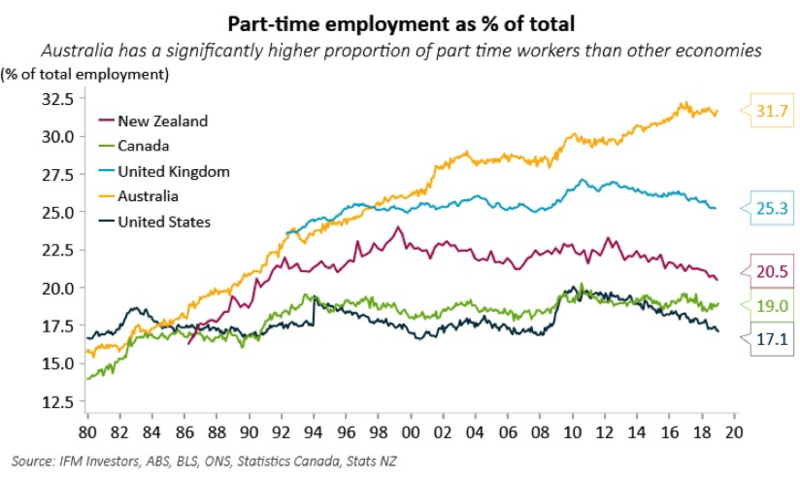 This is the part-time employment share across the anglo-sphere. What it shows is that a lot of jobs in Australia are part-time. It’s 32% here – almost one in three. It’s just 20% in New Zealand. So while jobs growth has been strong, we’re not adding full time jobs. More and more we’re creating part-time jobs. And the thing about part-time work is that it tends to be a bit precarious by nature. If you’re only on a part-time contract, you’re not in a position to be hustling for higher wages. And so the growing share of part time employment helps us understand why wages growth has been so underwhelming. … which in turn helps us understand why inflation outcomes have been so soft. … which in turn helps us understand why the promised rate hikes just never materialised. I think a lot of economist in the market and at the RBA thought that this would just sort itself out. But now, they’ve collectively given up on it. The wages boom isn’t coming. Rate hikes are off. This is the new reality. They just started giving money away… Whaaat? The 20th anniversary of the zaniest moment in economics shows us just how far we haven’t come. This month marks the 20th anniversary of one of the strangest events in economic history. Maybe you never heard of it. It was 1999. The internet was still getting of the ground. Facebook was still just a pimple on Mark Zuckerberg’s teenage mind. But one small pacific nation decided to do something ‘radical’. They’d be having a bit of a rough trot, and the economy was in the doldrums. So their wacky leaders came up with something zany – FREE MONEY. Yep, they just made money free. They were giving it away. Not only that, when people weren’t taking it off their hands fast enough, they started buying stuff off people, to put even more money in their pockets. It was crazy-town. La-la-ville. Why-don’t-you-have-your-pants-on-palace. Every economist in the world was predicting fire and brimstone. Wel… not all that much, actually. Nothing really happened. Inflation never materialised, growth never happened, and the economy barely changed stride. And that’s when we entered the twilight zone. It rewrote the economic rule book. And what this little pacific nation did became a template for America in the GFC, Europe in the 2010 EuroFunk Contest, and Australia in 2020. This radical and crazy policy became the economic orthodoxy. It became the new normal. I’m guessing you’ve already tweaked that this ‘small pacific nation’ is actually Japan – still one of the most powerful economies in the world, though less so than in 1999. And what I’m talking about is ZIRP – the zero interest rate policy, and quantitative easing – buying financial assets off the financial sector. Ok, so it’s not exactly dropping money out of helicopters on ordinary people – the money still had to be funnelled through the financial system. They didn’t know how things would turn out. But they didn’t feel like that had a choice. So they swallowed the pill and jumped. And this is one of the key lessons for me. Policy makers don’t really know what they’re doing. They pretend that they do, but ask most economists how the economy really works, and they’ll tell you it’s more voodoo than physics. And again, today, we stand on a bold frontier, where no one really has any idea how the economy works or how we should manage it. Truth is, there is no ‘managing’ an economy, no more than there is managing a cyclone. We can tinker at the edges, but by and large it is out of our control. The other point is that our policy-makers’ go-to solution is any crisis is always to “throw money at it.” That’s what Japan did. It’s what the US and Europe did. And it’s what we’ll do too, when our time comes… and it will. There’s a lot of money to be made if you can get in the way of it. … I mean, like I did. All that money after the GFC had to wash up somewhere, and a good chunk of it washed up in Australian real estate. But yeah, 20 years on and nothing has changed. We don’t know how the economy works. We only have a few tools at our disposal, and most of them involve throwing money at the problem. I know I’m asking you to take a red pill here. I’m asking you to leave behind the comfortable illusion that someone somewhere knows what the hell is going on. Once you wake up to this reality, you start to see opportunities everywhere. Sentiment matters. It’s just one of the realities of the market. Sometimes mood just matters more than fundamentals. But how much of that is based in reality? Not much, according to Goldman Sachs. The Australian arm of the old Vampire Squid reckons that market sentiment is currently running miles ahead of reality. Exhibit one in that argument is this chart here. 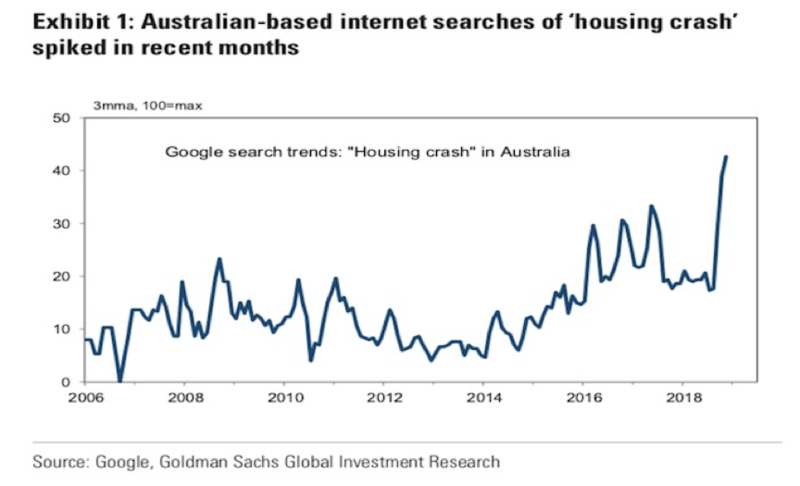 This is the number of Google searches for the term ‘housing crash’ in Australia. Goldman Sachs is calling this phenomenon “doomsday chatter” and they reckon it’s just a bit silly. Their read on the data still suggests that things are tracking along ok. They are also keen to put to bed the idea that there is some kind of ‘credit crunch’ in effect. “In our view, this remains broadly consistent with our earlier view that the primary driver of softer loan approvals over 2018 has been lower demand from investors – driven by a normalisation in expectations for capital gains in Sydney and Melbourne. Yep. That’s right. The only downside for the property market is potential cuts to immigration. 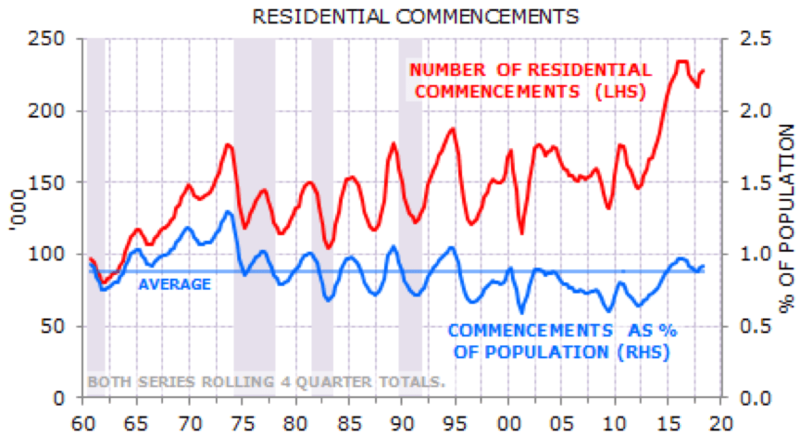 “In our view, the much more material risk to both the underlying supply/demand balance and the level of construction activity would be a significant reduction in population growth. “We note Prime Minister Scott Morrison recently proposed to reduce Australia's annual permanent migration quota by up to 30,000 per annum (or about 15 per cent) and redirect new migrants away from Sydney and Melbourne. So what? All good then? That’s what we’re saying? How likely is a recession this year? Not much. With prices in Sydney and Melbourne now down 10% year on year, some people are asking me if I think this means we are headed towards recession. It is true that there is a ‘wealth effect’ – as property prices go up, people feel wealthier and start to spend more. That goes into reverse when prices start to fall. But I still think Australia will be ok. There will be a period of adjustment, but my guess is that we should avoid recession, and bounce back fairly quickly. I thought it was interesting that Gerard Minack – one of Australia’s most bearish hedge fund advisors was taking a similar view. I tend to find myself on the sunny side of Gerard most of the time. So it makes me think that if even he is pretty relaxed about our current state of affairs, then we should be right. Anyway, he reckons that while the wealth effect is in effect, there are some important ‘countervailing forces’ that should keep the boat afloat, and help us avoid a US-style GFC. 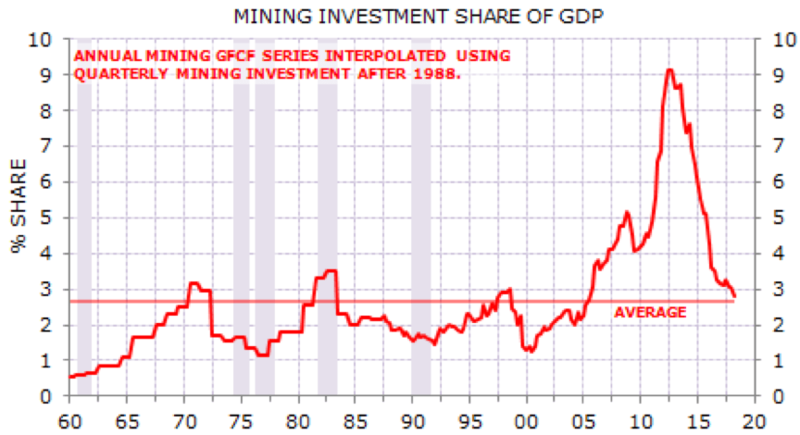 First, the mining capex boom inevitably bust, but the bust has now almost run its course (Exhibit 2). 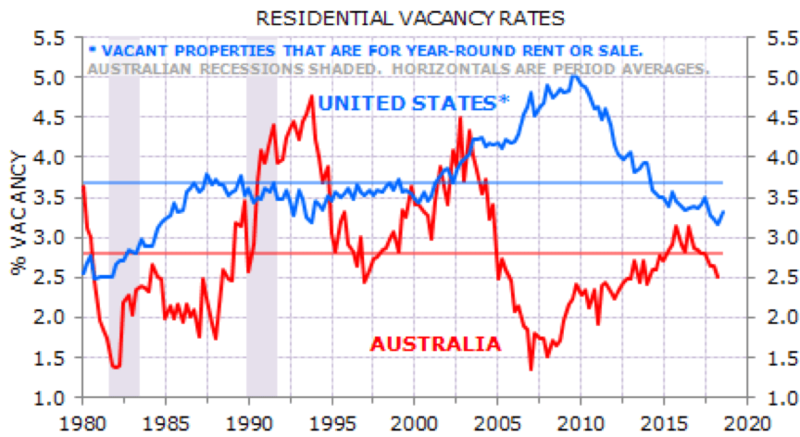 As a result, Australia’s rental vacancy rate is below average and falling, versus the US vacancy rate that last cycle was above average and rising (Exhibit 4). 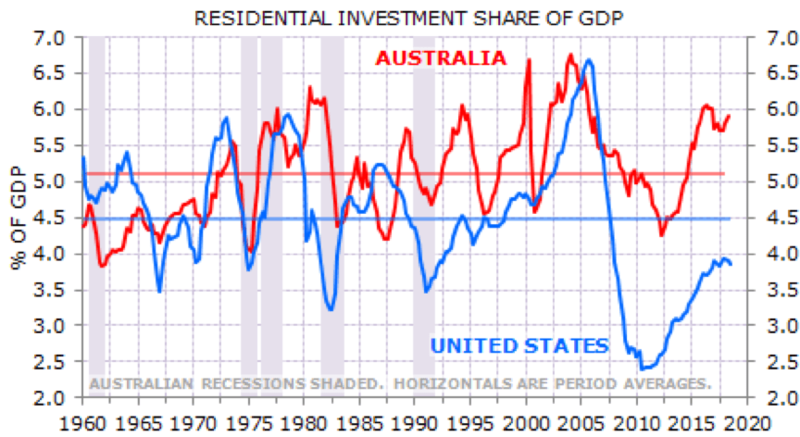 A turn lower in residential construction still seems likely in Australia, but there seems less scope for the residential downturn to king-hit growth, as it did in the US in the last cycle (Exhibit 5). 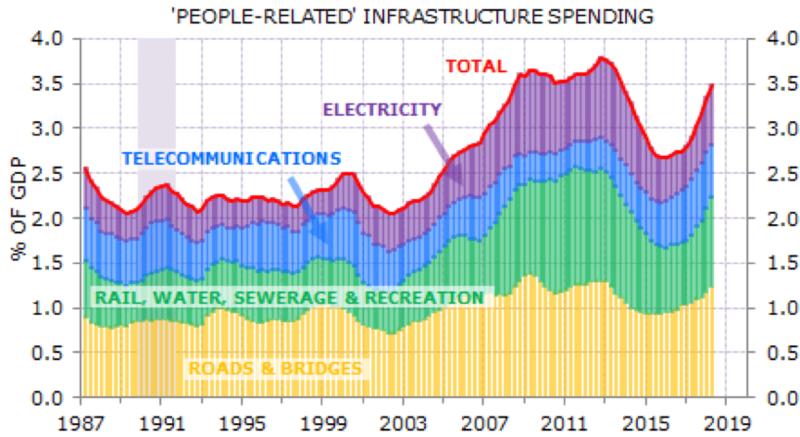 Third, high population growth costs, and one of the costs is rising infrastructure spending (Exhibit 6). This is a particularly job-intensive sector. 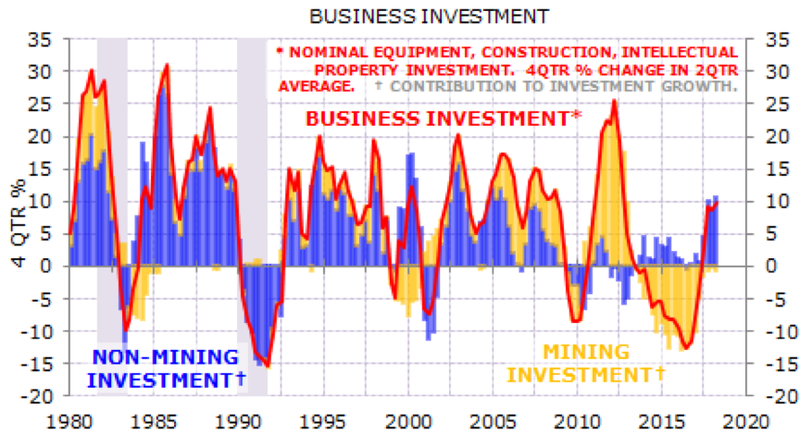 The net effect of the mining capex bust ending and the cranking up of infrastructure spending is that investment spending has rebounded (Exhibit 7). A fourth, less important offset, is the ramp up of LNG exports (‘mineral fuels’ in Exhibit 8). This will statistically add to GDP, although it will be calorie-lite growth: the employment tied to these exports is low; very little of the revenues are going to be collected by the government; and shipping so much gas offshore has created a domestic gas shortage, a key reason behind rising domestic energy prices. At the end of the day, Minack recognises that Australia is in a period of adjustment. We are working through some challenges. But he also reckons that these challenges have mostly already been priced into markets (Aussie dollar, bonds, equities). He doesn’t see value in shorting any of these things right now. For these short trades to work, an Australian recession has to be your base-case scenario. For Minack, he just doesn’t see that happening. And that’s what I reckon too. Yes, house price declines will give everyone a bit of pause for thought. But the Australian economy is much more than our housing market. It is much more complex and dynamic than just that. And Australia still has an awful lot going for it. There is still a lot of growth to be had and money to be made. I mean, even the bears think so. Hayne: what it means for property… and capitalism! Hayne says the problem is capitalism. The solution? Let’s all move to fairy-land. Ok, so I’ve been digesting the Hayne Royal Commission report over-night, trying to make sense of it all. But there’s something weird at the heart of it all. This is being billed as a reset of the financial industry, but I don’t see any major changes here. 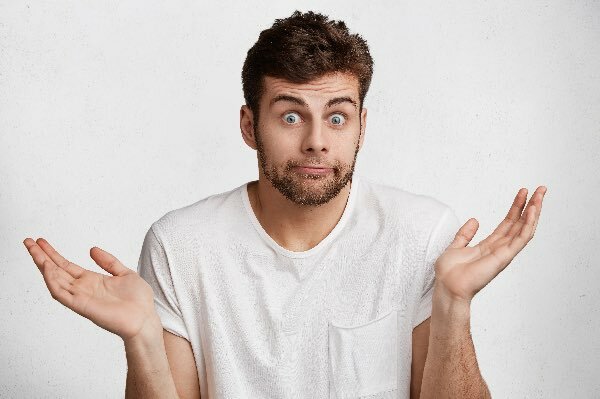 The banks aren’t having to break up their vertically and horizontally integrated business models (e.g, where a bank owns a funds manager that recommends the banks products to its customers), and apart from doing more to comply with the law, the banks aren’t being asked to change their business models in any real way. Hayne went to lengths to point out that he didn’t see any need to change the existing laws, only to make sure that the laws were being properly and prosecuted. On that front, the regulators need to do more, and he wants to see them being less shy about prosecuting banks under the law. Remember how ASIC dealt with the Comminsure scandal by asking for a $300,000 community contribution rather than issuing an $8 million fine? Hayne probably has a point. As Hayne uncovered more and more dirt on the industry, the banks started tightening up their credit standards. The fear I had was that Hayne would push this further and harder, and credit would slow even more. This hasn’t happened. There’s no recommendations here that are going to crimp credit. That said, there’s nothing here that relaxes credit either. The banks have already started moving away from income and expenditure benchmarks in favour of looking at customers actual income and expenses, and Hayne wants this to continue. For property prices, I reckon Hayne is neutral, and given the banks’ history of successfully watering down reforms, possibly price-positive in the long run. I can see there is a mis-alignment of incentives with trialling commissions paid by the banks, but killing the industry without putting in place something to help your average punter navigate the complex world of mortgage finance is a recipe for ripping people off. This is where we get to the bit where it’s just a bit weird for me. Hayne reckons there’s a problem with the banks’ “culture”. Not “culture” in the sense of their rock art and quixotic dance rituals, but culture in the sense that many people in the industry seem to be motivated by money. “Why did it happen..? Too often, the answer seems to be greed – the pursuit of short term profit at the expense of basic standards of honesty. How else is charging continuing advice fees to the dead to be explained? Staff were rewarded by reference to profit and sales… what a highly unusual business model that is. What are freakishly strange culture to have. I mean, you wouldn’t see that in my business. My staff are motivated by my witty company-wide emails and by premium biscuits in the break-room. Money never comes in to it. But seriously, what are we even talking about here? Yes, capitalism has its flaws. When people are motivated by money, sometimes people with low ethical standards do things that people with higher standards wouldn’t do. There’s nothing new there. But are we really suggesting we should remove the profit-motive from banking? And if so, why stop at banking. Let’s just make profit illegal altogether. Let’s move to an economy-wide biscuit-based incentive structure. Let’s all move to fairy land. But no, I actually think this talk of culture is a squib. It allows us to feel morally righteous, while doing nothing to address the fundamental issue – the disproportionate power that has been allowed to accumulate in the finance sector, and the captured, wet-lettuce approach to regulation. But no, we’re not tackling that. We’re talking about some fantasy culture, where no one cares about money. Is The Global Economy Making Our Property Prices Fall? What does the “globalisation of property” mean for investors? Do you want to invest in the global economy? Even if you’re investing in boring old properties down at the end of the street, these days you are still investing in the global economy. We are all globalists now. We’re in the middle of the Knowledge Source Power Challenge and today I wanted to have a look at why I take such an interest in the global economy, and why relentless self-education has to be one of your habits. Bloomberg was running the story last week about how a number of property markets across the world are following each other lower. You thought it was just Sydney and Melbourne, but no, we’re not alone there. Similar dynamics are playing out around the world. The number of home sales in Vancouver dropped 32 percent in 2018 from the previous year, following a series of new taxes, stricter mortgage rules and rising interest rates. Median prices in Auckland registered their first annual drop since 2008 after the New Zealand government passed legislation to restrict foreign buying that it said was partly to blame for escalating housing costs. Home prices have dropped 11 percent in Sydney from their 2017 peak after government restrictions on foreign purchases and tighter credit. I knew this was happening but it was interesting to see the data all in one place. It’s on the IMF’s radar too. Last year they released a report showing that house price growth has become increasingly synchronised at both the city and country level, particularly since the global financial crisis. The global economy is a new beast. Financial markets are integrated, inflation trends are global in their reach, interest rates are synchronised thanks to free-flowing capital, and institutional money managers tend to hunt in packs. Taken together, all property markets, even your humble little suburb, are global property markets now. I mean, it used to be the case that houses were just consumables. They were just things people lived in. Then, with the rise of the property investing class, they became assets. They became things we invested in as well as lived in. And now, with the integration of the world’s financial markets, they are behaving like financial assets – like stocks and bonds. What happens here depends on what investors all over the world are doing. This is the new reality. Property is a global financial asset. And it means we need to keep one eye on what the global economy is doing. We need to keep our vision broad. Now that is easier said than done. I’m lucky enough to have a research assistant who keeps me up to speed. (Of course I’ll share the gold with you here – watch this space). But for now, it is just enough to take an interest in this space. And even simply being aware that property now behaves like a global financial asset will put you a good stride ahead of the pack. But the broader point here is that no strategy survives for long. The world is changing. Strategy’s that made sense five years ago are obsolete now. So we have to treat our education and development as an ongoing concern. It’s not a do-it-once, set-and-forget type thing. You need to be constantly curious – how can I be better, stronger, more savvy? Curiosity is the key. Ask the question, and the rest will take care of itself. I don’t think people realise how scary the future could be. Are you ready? So we’re in the middle of the Knowledge Source Power Challenge – today, I want you to imagine you’re a horse. It’s 1919 – 100 years ago. It’s around the peak of horse usage across the planet. Henry Ford started mass producing cars in 1913, but our cities are still geared around horses and horse transportation. You’re one of thousands of horses in stables all over the city. Another horse gets led in, looking very sad. “Hey mate, why the long face?” you say, because you are hilarious. But in a few years, you’re dead. And most of your friends are dead, and the horse population plummets. Ok, now imagine you are you. Imagine you have a job. Let’s say you’re a truck driver. Or an accountant. I walk in looking sad. I tell you that computers are already doing many things better than us. Truck drivers and accountants will be the first to go, but superior technology is coming for every job there is. Now I don’t imagine for a second that we’re going to start culling humans or putting a stop on our human breeding programs. But there must come a point at which human labour is no longer economical. It’s happened in many industries already. In automotive manufacturing it was decades ago. But thankfully, humans are very adaptable. An automotive worker could be retrained into a hair dresser or a graphic designer or whatever. Our adaptability has meant we have remained economically viable for a long time. But that can’t go on forever. We are not infinitely adaptable, and technology is advancing at an incredible pace. Jobs are being destroyed faster than we can replace them, and I really think at some point there will be very little left for humans to do. And that doesn’t mean we’ll all being enjoying lazy leisure time, with robots serving us Margarita’s by the pool. It mostly likely means we’ll be herded into slums and sold opiates and handguns. If you think our ‘leaders’ are going to look after you, you’re dreaming. That is one thing our system is not set up to do. Sure, we live in a lucky country. If you’re temporarily out of work, there’s a safety net to stop you from going under. But that safety net is not designed to support 90% of the population through permanent and irreversible unemployment. I really think this is going to happen in your life time (unless you’re already 90). The writing is on the wall. So what are you going to do about it? How are you going to survive the jobs apocalypse? You’ve got to take your future into your own hands. You have to make yourself, and your wealth, bullet-proof. And really, the jobs apocalypse is just one scenario. There are dozens of world changing phenomenon bearing down on us at rapid speed. The one point I need you to understand is that you can’t rely on anyone else to save you. You can’t rely on the economy – it’s an abstract concept that has no preferences for the distribution of jobs and wealth. You can’t rely on the government – because the government is beholden to its sponsors, and they probably don’t give a fig about you and your whiny needs. And you can’t rely on society, because when everything breaks down, it’s everyone for themselves. All you can rely on, is you. So get ready. Get tough. And get yourself sorted. The future is exciting. But if you’re not ready, it could be terrifying. I love a good tech story, but this one is downright scary. For some reason I went down a bit of a rabbit-hole with high-frequency trading and robo stock traders this week. I thought I’d share a bit of that with you here, not to make the point that the stock market is rigged (you knew that already), but just because the way it is rigged and the way the robot traders work, is just kind of mind blowing. So yeah, money and tech. Two of my favourite things. Ok, so I’ll admit I had no idea how robo-traders worked. When I first heard about them, I imagined a robot like Dexter from perfect match, going through stock-picking newsletters and picking the ones it liked. But I then learnt it had something to do with algorithms, which again I thought was about mathematical ways to pick stocks, or pick market momentum – technical analysis on steroids. But the truth is much scarier. And we have a Hedge Fund guy named Brad Katsuyama to thank for that truth. He noticed that his capacity to execute trades was falling. That is, on the computer systems traders use, they have something on their screen that tells them the stock price, and how many stocks are being offered at that price. So say, Westpac, WBC at $2 a share, with 100,000 shares on offer. In 2006, if Brad saw there was 100,000 stocks on offer, and he wanted to buy them all, he’d get them. But in 2007, if there was 100K on offer, he’d be lucky to get 80K. In 2008 it was down to 70K. And by 2009 it was down to 45K. The screens would tell him that there were 100K, on offer but if he tried to buy them, he’d get less than half of what he wanted. At first he thought it was just the market moving at the same time as he was trading. But even in slow moving stocks, where trade was thin, he’d get the same problem. He realised some sort of event was shifting the market, and he was that event. So he went digging. He discovered a few very interesting things. The first is that that 100,000 shares was not housed at a single exchange, but was rather distributed across 13 different exchanges. (This is America we’re talking about). And when you executed a trade, you didn’t put your order in with an exchange, you sent it to a ‘Smart Order Router’. The router would then split it up and send your trade on to the relevant exchanges to complete the trade. Thing was though, the trades didn’t arrive at all of the exchanges at the same time. The further away the exchanges were, the longer it took. (I ripped these images from a talk he did recently). This created a window of opportunity for the robo-traders. When Brad looked into it he found that there was about 2 milliseconds between when the trade arrived at the first exchange and the last exchange. He thought, wow. That’s pretty quick. It takes 300 milliseconds to blink your eye, so 2 milliseconds (0.002 seconds) was fast, right? Actually no. When he looked into it, the robo-traders could get their trades to the exchanges in 476 micro seconds. A micro second is a millionth of a second. So that’s like, 0.000476 seconds. How does time even make sense at that level? It is beyond human comprehension. But the robots got it. And the robots were using their speed to their advantage. What they would do is ‘front run’ Brad’s trade. So when he says, buy 100K WBC and hit go, the robots get in front of his trade. They would withdraw their sell offers and buy up WBC for themselves to sell on to him at a profit. And so while there’s 100K on offer when he hits his button, by the time the robots have run ahead of him and done their thing, he’s lucky if he gets half of what he wants. He calls this latency arbitrage – using the time lag between servers to your advantage. I still find it mind blowing. This is how lots of people make money these days. By getting super fast robots to run ahead of people’s legitimate trades and mess them up. And I mean a lot. On some days, 75% of trading volume is done by robots. Rather they make their money by selling super-fast tech and super-fast data to the robot masters. That is, they are enabling latency arbitrage. They are creating a class of people who have more info than others, and who then use it to their advantage. Stock exchanges are enabling insider trading. Until a robot shows up to auction one day, I think I’ll stick to property. The Liberal party is in serious trouble, but I think investors have something to look forward to. So seems Labor’s landslide victory in Victoria caught everyone off guard. I’m still amazed that this can happen. Facebook and Google know what kind of aftershave I use, but we still can’t get a good handle on voting intentions? Seems a bit buggy to me. Anyway, the results are in. The Labor Love Fest is off the charts. Biggest win in a generation. I’ll explain what I think it means for wealth strategy in a sec, but first I wanted to step back and look at the bigger picture. Now, no shortage of ink is being wasted on the Liberal Party autopsy and a good chunk of that is pointing the finger at the shenanigans in Canberra, especially the knifing of Malcolm Turnbull. But I actually think there are some broader structural issues at work, and I worry that the Liberal party is about to get blindsided into oblivion. Seriously, they might be toast. First, I think they’re underestimating where the average voter sits on a lot of issues, and in states like Victoria, the average voter is a lot more ‘progressive’ than I think they realise. Daniel Andrews told me so. “Progressive” is a relatively new term in the Australian political vocabulary, and it’s never really featured much in political branding. And you wouldn’t use it much anyway. It’s like ‘conservative’. Conservative might describe your base, but you’re trying to win votes in the political centre, so you use language that speaks to that. But Daniel Andrews is using “progressive” and using it a lot. This isn’t an accident. This is deliberate language use, and the Labor party must know it’s polling well. Which means that it’s a term that now sells to the political centre in Victoria. To the Liberals, and their infamous conservative faction, this is very bad news. They must have known they were taking a gamble. In knifing Turnbull, they were saying they were willing to risk some inner city seats to save some marginal seats in Queensland. But then they f-ed it up royally, when, rather than making Dutton leader – the only person who could save those seats in Queensland – they gave us Morrison, who is just a bit yeah, nah with everybody. So they sacrificed Victoria and achieved nothing. But there’s something else Andrews is doing here. He’s not just speaking to the centre; he’s creating a Victorian political identity. He’s saying Victoria votes for progressive parties just because it is Victoria. If he can succeed in getting people to associate “progressive” with “Victorian” – to see them as one and the same – then he will have locked Labor in for a generation. It’s like the blue state / red state phenomenon in America. States like California are locked in blue states (Democrat), and proudly so. It becomes a badge of pride. Victoria is Australia’s first blue state (or red state really). This is clever. Very clever. And I don’t know the Liberal party has a counter-play. To do something similar, it has to go against the tide of history. They could try to take Queensland, but it’s hard to imagine a Queensland Premier running a campaign around “the most conservative government in the most conservative state.” It’s a promise to be backward looking. It doesn’t have the same ring to it. And to do so, they’d need to abandon a large chunk of their voter base – the voters that don’t really resonate with the term ‘conservative’. I’ve voted Liberal most of my life. I did on the weekend. But I don’t identify as “conservative”. I don’t look back at the past and think we need more of that. I’m forward looking. I’m excited about change. I’m excited about the future. I’m much more Malcolm Turnbull than Peter Dutton. I vote Liberal because I believe individual freedom should be society’s primary goal. I vote Liberal because I believe enterprise and endeavour are the cornerstones of a successful society. I vote Liberal because I believe that our soft hearts need to be guided by sensible, hard heads. It’s never been about whether there’s enough flags or bibles in our schools. So the Liberal party is in trouble. Unless they can figure out a way to build a tent large enough to hold both their progressive and conservative voters, it will tear itself apart. … if that hasn’t begun already. And so, I promised I would look at what I think it means for wealth strategy too. I think the Victorian election showed us we’re on the verge of a Labor nation. I think the Coalition is in trouble Federally and in most states. If they get the mandate I expect, like they did in Victoria, then expect some pain. Expect a tough response to the Royal Commission. Expect no mercy on the interest only to principal reset. Expect negative gearing to go. That might freak some people out. Amateurs might bail out of the market at that stage. But I think Labor will be smart enough to try and spend their way through the pain. Expect a spending spree based around ‘fairness’ – first home owner grants to low income earners, an increase in the dole, more money for schools, hospitals and infrastructure in general. Stuff like that. In the medium term, that will give the economy a boost. 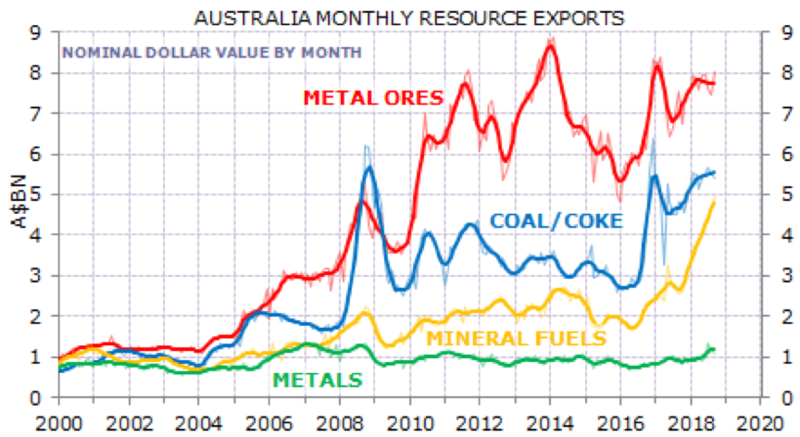 There’ll be more for everyone (so long as commodity prices continue to support the budget bottom line). So keep your eye on this. Don’t bail too early. Look for serious reform and strong but sustainable spending. There might be some short term pain, but it will pay off in the medium term. And watch for that term ‘progressive’. See if the media picks it up and runs with it.